Congratulations to "Janice H." and "Laura", the winners in Alyssa's giveaway. Thank you to all who participated! I had to laugh, he was mirroring an action he had seen his father perform on numerous occasions – open a door for a lady (not just his mother). In today’s society where less emphasis is placed on manners and more on efficiency, I appreciated my son’s small gesture of civility. And no, I do not believe a woman’s place is in the kitchen. Trust me you do not want me to use your stove, unless you are looking to meet a fireman. However, I do believe in common courtesy. One of my favorite things about the Victorian Age and the reason I love writing about this particular time period is the display of social graces. Ladies and gentlemen behaved by a different code of conduct, which reflected the delicate nature of woman and the less barbaric side of men. Without civility we are nothing more than animals. Chivalry does not need to be a grand event. Sometimes it is a small selfless action, which means more to the person who receives it, than to the person who gives it. My favorite movie scene about courtesy comes from the film, While You Were Sleeping. Lucy tells Peter that he is heroic because he gives up his seat on the train every day. Peter responds that the action is not heroic and Lucy counters, stating it is to the person who sits in it. For the past year and a half, I had the tremendous pleasure to live in the Victorian Era as I wrote my debut novel, A Perfect Plan: Wiltshire Chronicles and its follow up, An Imperfect Engagement: Wiltshire Chronicles (no release date yet). It is an historical romantic suspense about a country girl raised by her brother and uncle, who is thrust into society when her brother vanishes. Unprepared for social expectations, Samantha must discover how to walk a fine line between who she is and how society requires her to act. Thankfully she has the help of her sister-in-law, Wilhelmina (who guides Samantha through every awkward societal interaction) and her guardian, Benjamin (a charming rake who is a quintessential gentleman in disguise). I hope you enjoy your time in the Victorian Age. I invite you to lose yourself in Wiltshire. Now he only had one more obligation to fulfill tonight. With Lord Edward Hastings’ unfortunate demise, a new duty rested on his shoulders. He was now the guardian of Miss Samantha Hastings, Edward’s little sister. Although a woman of her age hardly needed a guardian, chaperone would be a more appropriate word. Whatever the title may be, he now had the added responsibility of approving a husband for the lady; a task which placed him in direct control of her future. Not exactly a role he wanted to play. However, he just needed to marry her off to the first available suitor and he would be free of his promise. Still unmarried, he assumed she would be plain and willing to accept the first man who proposed; considering this was her first season, she would need guidance in that respect. Lady Hastings, Edward’s widow, would be able to assist with the husband hunting process. He decided he would leave the matching to her and then just approve whichever man made it through the tedious courting process. Benjamin tried to remember the face of Edward’s baby sister. Ten years ago, the last time he met Samantha, she attacked him with a foil. Her face screwed up with raw determination and a scowl as she swung at him from the landing of the Hastings’ country estate stairwell. Her verbal assault was almost as vicious; Edward must have been responsible for that lack of manners. A small girl with plaits and a sharp sword; the memory brought a smile to his lips. He chuckled softly, rubbing his left hand unconsciously. A tiny puckered scar still blemished his left hand. It seemed difficult to picture Samantha as anything else but a scrawny, ill-mannered child. He assumed, as an adult, she must resemble her brother; same chestnut hair, same blue eyes. Although decidedly more feminine, he corrected the image in his head. He would have no difficulty spotting her this evening. He only hoped she was unarmed. When was the last time you experienced a chivalrous act? What was it? Comment below to be entered for a chance to win one of two eBook copies of A Perfect Plan. Giveaway ends 11:59pm EST August 19th. Please supply your email in the post. You may use spaces or full text for security. (ex. jsmith at gmail dot com) If you do not wish to supply your email, or have trouble posting, please email maureen@justromanticsuspense.com with a subject title of JRS GIVEAWAY to be entered in the current giveaway. I live in a large country town. Quite often a gentleman in a cowboy hat will tip his hat to you as he walks by. I LOVE IT!!!! That sounds delightful. My kind of town. Often the little gestures are the ones that make the most impact. I have never seen the puddle one either. I would feel guilty ruining their jacket by stepping on it. I hit the jackpot with this blog post! I've read historical romances for years... and recently started reading romantic suspense stories. I think historical romantic suspense is a grand combination...more excitement and deeper plots along with the romance and history. I'm glad I got to "meet" you on this blog post, Alyssa! Thank you. It is wonderful to meet you too. There's nothing like a little murder to go with your romance. Congratulations to Laura and Janice H.! 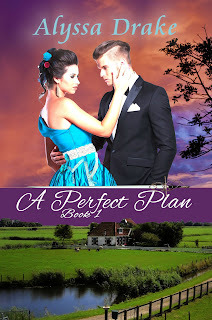 They each won an eBook copy of A Perfect Plan. Happy reading, ladies.